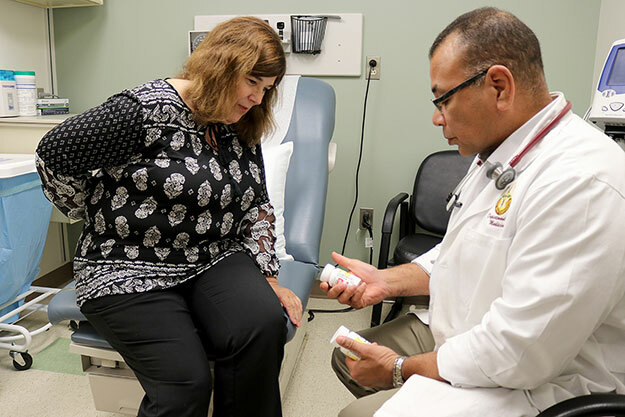 In October, Madigan's Internal Medicine Clinic moved into the implementation phase of a long-term quality improvement project addressing opioid use that aims to improve both patient safety and quality of life. It is already showing impressive results. "We had two goals with this: Improved compliance with safety standards in our clinic but also to make sure that people who are on COTs -- chronic opioid therapy -- had better quality of life," explained Capt. (Dr.) Nupur Garg, a physician in the Internal Medicine Service. "And that we appropriately prescribe them." "Just our safety compliance data show that we went up from 26 percent compliance with 18 measures including physician documentation, dispensing opioids, all of that, to 75 percent after 90 days of implementation of our new policy," said Garg. "We as a clinic were ready and willing to get this initiative started," said Lt. Col. (Dr.) Nouansy Wilton, a physician and the Chief of Internal Medicine. "The first person we spoke to was Pam. Not sure what she'd say, but she was instantly on board. So, it was just the right time," Wilton added. Pam Birgenheier is the Chief of Care Management Services. She responded to that call by noting, "It was exactly what they should be doing." "One thing I think we really try to do as a clinic is work with our patients," said Wilton. "We have our dog in the game; we're there with you. I think the patients really respect that." One way this initiative does that is to immediately provide consultation and education. "Whenever the providers see one of the chronic pain patients, they'll then send them to the case manager," Birgenheier said. She is happy to see the data being collected show that this element is having an impact on reducing opioid use -- supporting both providers and patients. As many patients have either had their doses of opioids reduced or eliminated completely, alternative treatments for pain management have been vital. Birgenheier recited a number of these, to include the Move to Health: Powered by Performance Triad initiative offered at the McChord Clinic, Living Beyond Pain classes that Family Medicine provides and the Armed Forces Wellness Center and its programs and classes at Jensen Family Health and Fitness Center. Wilton added to the list of support services and programs. "I think we're lucky as an Army Medical Home -- we do have a lot of resources. We have our health psychologist; we have case management; we have a social worker, and a pharmacist as well. So, we really have a multidisciplinary approach we can use. I would say the smaller clinics don't have a lot of the resources we are able to use," said Wilton. Streamlining the prescribing process itself has also served to clarify the new standards for patients. The points of contact for narcotic medication have been reduced. There is now a single line to call for refills. The new policy also calls for the pharmacy to only provide narcotics refills on Tuesdays, Wednesdays and Thursdays. This provides better oversight of these prescriptions and ensures no refills fall on a holiday or training holiday when the pharmacy is closed. This keeps the patient supplied with the proper amount of medication at all times, cutting out guesswork and the potential for running out of medication. Overall, there is more standardization, communication and education. "There's an awful lot of education that goes into our interaction with our patient," said Wilton. "We lay out the expectations so our patients are not surprised." Wilton said she engages with her patients by informing them of the newest research in pain management. "We are learning more and more information about the adverse reactions, adverse side effects you can get from the overprescribing of narcotics. This is what we know now, which is different from back then. So, there is definitely a shift in how providers are looking at the prescribing of narcotics," she said. Garg noted that the increased interaction between provider and patient has been absolutely elemental to this shift, centering on education. So far, data has been collected on the providers' side in tracking safety measures. Next, the project will collect data from the patients on changes they have noted to their quality of life. Anecdotally, Garg has heard some encouraging stories from her patients. "I have probably weaned off about 70 percent of my patients at this point. Most of them have told me that they feel better; they feel like they are more present in their day-to-day activities," she said. "When you target the reasons they are on these medications and give them alternatives, they find that if it doesn't improve, their pain is no worse than it was on that high dose of opioids." A look at the data collected so far reveals that compliance across 18 safety measures has improved by 50 percent, and use of alternative forms of treating chronic pain has increased 84 percent. One safety assurance tool that was not used previously and has been fully implemented with this initiative is the Washington Prescription Monitoring Program. All chronic pain patients prescribed narcotics have their prescriptions tracked through this system to prevent duplicate prescribing and any other possible concerns. Moving into the second phase of data collection, Birgenheier said the team is now querying patients about how they feel the new procedures have affected their quality of life.